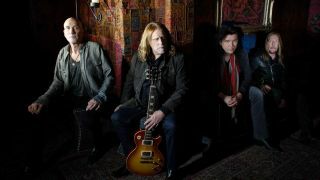 Gov’t Mule have premiered their version of Rolling Stones track Can’t You Hear Me Knocking with TeamRock. It’s taken from Stoned Side Of The Mule, recorded live in Philadelphia in 2009. Band leader Warren Haynes has embarked on a series of concert releases aimed at proving his outfit’s versatility. The latest title follows the group’s Dark Side Of The Mule, Dub Side Of The Mule and Sco’Mule, featuring the band’s takes on Pink Floyd, reggae and their collaboration with John Scofield respectively. Stoned Side Of The Mule is released on April 20 via Provogue in limited-edition vinyl only. It’s available for pre-order now. The band play London’s Shepherds Bush Empire on May 25.